"Lies. Betrayal. Sacrifice. How far will you take it?" The movie The Departed directed by Martin Scorsese and produced by Brad Pitt is a movie that takes place in Boston and portrays how much the Irish Mafia influenced the Massachutes State Police Department. The movie is made up of an all star cast with Leonardo DiCaprio, Jack Nicholson, Matt Damon, Mark Walhberg, Martin Sheen and Alec Baldwin to name a few of the major stars. This movie is packed with action, murder and manipulation with a shocking ending. We start with Billy Costigan played by Leonardo DiCaprio, he is new police officer fresh out of the academy. He starts out by trying to make a name for himself in the law enforcement world and is drug in by Martin Sheen to go deep undercover to possibly bring out the mole on the force. While deep undercover get into business with Frank Costello the mob boss played by Jack Nicholson, where he has to do some really dirty work to gain his trust. He takes a major beating from Frank with his own work boot, where he gets his hand that is in a cast smashed. Once he proved his loyality to Frank and his gang he was in, and on his way to find the dirty cops for Internal Affairs. Colin Sullivan played by Matt Damon is a young cop with a criminal mind makes everyone on the force believe he is just one of the good old boys and a super cop. Colin in all reality is a dirty cop and the leak in the force, who makes profit from the criminals he should be arresting. When he and Billy are about to get caught in their alter lives they come out guns blazing and this is where the surprise ending keeps you on the edge of your seat. 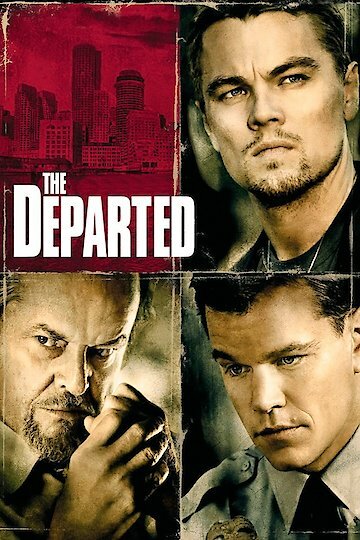 In closing this is a great action movie that you will need to watch to see what happens to the rest of the all star cast of The Departed movie. The Departed is currently available to watch and stream, download, buy on demand at Netflix, Amazon, Vudu, Google Play, FandangoNow, iTunes, YouTube VOD online.